2). I was just giving my reasons. A major point in the dividend debate is the fact that dividends are taxed at a higher rate than capital gains. Most people think that the money will be better spent by the taxpayers than the government. I think that some investors believe that they will spend the profits better than the folks who run the company hence they want to share the profits. This desire for dividends may be driven by the exorbitant compensation paid to company executives. Bogle addressed the disparity between worker compensation and executive compensation in The Battle for the Soul of Capitalism. This is an example of the behavioral aspect of investing. Since I invest in mutual funds, I realize that I'm invested in companies that pay dividends and companies that do not. Consequently, I will have to pay taxes on both dividends and capital gains. Death and taxes - unpleasant and unavoidable aspects of the human condition. Dead Man Walking wrote: A major point in the dividend debate is the fact that dividends are taxed at a higher rate than capital gains. Most people think that the money will be better spent by the taxpayers than the government. I think that some investors believe that they will spend the profits better than the folks who run the company hence they want to share the profits. This desire for dividends may be driven by the exorbitant compensation paid to company executives. Bogle addressed the disparity between worker compensation and executive compensation in The Battle for the Soul of Capitalism. This is an example of the behavioral aspect of investing. Not everybody is taxed at a higher rate on dividends, maybe you but not me. If i could have a $100 dollars every time i hear or read that statement then maybe it might be true. Too many people on this mess board live in a bubble. If you in the 15% or less tax bracket its the same. naha66 wrote: Not everybody is taxed at a higher rate on dividends, maybe you but not me. If i could have a $100 dollars every time i hear or read that statement then maybe it might be true. Too many people on this mess board live in a bubble. If you in the 15% or less tax bracket its the same. Even if your tax rate is the same between the two, the dividend tax is effectively higher because the basis on which the tax applies is smaller when calculating capital gains. You are absolutely right that tax cost is a result of individual circumstances. There probably are too many generalizations made about things like this. However, one point you may be missing is that when shares are sold not all of the principal liquidated is capital gain and hence the tax rate is not applied to all of the proceeds. There could even be a capital loss. Another factor about capital gains is that they may never be taxed if the position is liquidated just after being inherited with basis step-up. The right thing to do is consider one's personal situation. just lived off of the dividends and passed it down to my kids/charity at death someday? $1.0 million x 3% = $30,000 per year. $2.0 million x 3% = $60,000 per year. $3.0 million x 3% = $90,000 per year. Does that sound like a good workable plan? just lived off of the dividends and passed it down to my kids/charity at death someday. You still completely do not understand the concepts of dividends. return, and "never selling the portfolio." On the other hand the plan you put forth is to make fixed (hopefully inflation indexed starting with 3% of the initial portfolio) withdrawals from some nest egg you have managed to save. That is a conventional safe withdrawal scenario at a conservative rate. This has nothing whatsoever to do with dividends other than the awkward and difficult finagling to engineer and annually re-engineer your holdings to deliver exactly the dividends you need. If you can get more than 3% dividends from an otherwise efficient and balanced portfolio it becomes easier because you can reinvest the excess and don't have to do so much finagling. I think everyone should have some fraction of income annuitized, but SS may be enough to fill that role. "Selling the portfolio" to generate income and taking dividends as cash are not fundamentally different types of activities. That is the whole point of this thread. 2) It's mindless (i.e. you don't have to take any action to get your returns, you just cash the dividend checks). 1) The amount of money you get each year will vary significantly. Dividend yields aren't stable, which will affect how much you get each year, and capital gains will change your base so that even if the dividend yield % was stable, you'd get a different amount each year. So if you were trying to use this to offset predictable expenses, it won't be great. 2) You'd be more diversified and better off getting a total stock market fund which has a lower yield and then selling shares every quarter to make up the difference in yield between the total stock fund and the high dividend fund. Though even better than this might be withdrawing a set amount (dividends + capital gains) in year 1 and increasing for inflation so it can offset predictable expenses, with perhaps some modest reductions in bad stock years and increases in good stock years. 3) A little bit of money in bonds could help provide more stability. You seem to be really married psychologically to this idea of a high dividend yield portfolio and then living off the dividends, despite about 10 different people explaining why this is sub-optimal. But then you keep coming back and suggesting the same thing. So at this point, I kind of feel like you want to believe what you want to believe. Last edited by Bfwolf on Mon Jul 10, 2017 12:22 pm, edited 1 time in total. Last night I went through the stock holding of VHDYX. sweet little fund. Vanguard did a excellent job with it! Companies come and go, dividend yields rise and fall. Let us know how it all turns out. Well, it's an index fund so Vanguard didn't really "do" much of anything with it, except choose the benchmark they wanted to mimic (the FTSE High Dividend Yield Index). It's a fairly diversified fund so you could certainly do worse, but by choosing it rather than the Total Stock Market Index, you have made a bet on certain sectors that are over-weighted by this fund vs the total market: consumer goods, oil & gas, telecommunications, and utilities. You have made a bet against other sectors that are under-weighted by this fund: consumer services, financials, and technology. So you are essentially stating that you know better than the marketplace which sectors will outperform in the future. Do you have any reason to think you are better at forecasting stock performance than the professionals who do this for a living? You need to let go of your preconceived notions of how the stock market works and how dividends work. I highly encourage you to go read the Bogleheads Guide to Investing. Things change. A lot more than you might expect. 4	JPMorgan Chase & Co.
5	Wells Fargo & Co.
8	Procter & Gamble Co. Plenty of names you recognize in there, but a whole bunch more that are no longer with us. What do you think has fared better over the past 30 years? A fund of those 30 'blue-chip', dividend paying companies, or an index that captures the entire market? This is a common fallacy of dividend chasers - that these are big companies that aren't going anywhere. A quick look at the history of the Dow proves this to be false. Most people who sing the praises of dividends are being mightily misled by a severe case of survivorship bias. You guy's are good & it's much appreciated...thank you for the great conversation! (getting into the weeds of this whole thing). As I see it the Total Stock Market is a very good fund! medium companies that are never going to do anything. of these stocks would be classified... speculation stocks. competitive advantage over small & medium sized stocks. snarlyjack wrote: You guy's are good & it's much appreciated...thank you for the great conversation! Some of these now speculation stocks someday will be paying dividends. There are, as you point out, thousands of smaller companies in the Total Stock Market index, and many of them are not going to do anything. But some of them are going to do TREMENDOUS things, and that's where a lot of the growth in the stock market comes from. Big companies may have wide moats and established brands, but none of this is information that's only privy to you. Every investor knows it, and this is baked into their stock price. As far as this idea of "self cleaning," in the Total Stock Market Index, you own all the companies that both rise and fall so I guess it is "self cleaning." With a High Dividend yield fund, you do not. Consider Microsoft, your #1 holding in your High Dividend yield fund. For many years, and during its meteoric stock climb, Microsoft paid no dividend and would not have been owned by your fund. You would've only bought Microsoft AFTER it had picked up its largest stock market gains. the past 4 years. What about the next 80 years? of the stocks I don't have. Something like 60/20/20. I think you'd be better off with 80% Total Stock Market and 20% Total Bond Fund. funds like TSM over all ten year periods I've seen. indexes only include stocks that are already in some index. available for dividends in a high payout company, etc., etc., etc..
Roth tax-wise. I said before I'd invest 10%. 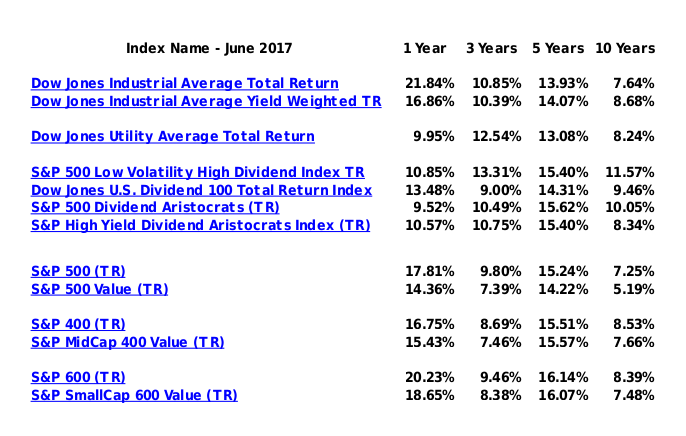 Can you tell me more about these dividend funds that have historically always outpaced TSM? Will they continue to do so in the future? snarlyjack wrote: I don't see a reason why a person could not live off of that fund for years to come. Decades ago Vanguard had a High Yield Stock Fund. It was actively managed by a very highly regarded fund manager. However, its total return for 1990 was wretched. In 1991 the fund was merged out of existence (warning: correlation does not necessarily indicate causation). Just because an equity fund has a high yield does not mean that it will be more successful over the long-term as a source of money than lower yielding funds. Can you give an actual fund ticker symbol that is a high dividend fund and that has outperformed TSM over X year period (5, 10, 15, 20, etc)? I don't understand how this works in all cases. Case: 100 shares of XYZ at $100 each. 2% dividend. Taxable account. If reinvested, there are now 102+ shares at $98 each. Must include the dividend when filing taxes. Tax impact is different for different people. Zero for some. How does it make any difference whether the dividend is reinvested in XYZ or in another company? Only if the dividend is spent is there less invested. On the last, I agree Total Return. like ticker SPHD. None of the ETF's today exactly replicate the "indexes"
periods in question. Until another study surfaces that's all that's known today. did comparing the S & P 500 to High Dividend Yield stocks. 1957 thru 2002 "The Future For Investors". Thanks for your studies Patrick...they were interesting & informative. I like dividends on a (relatively small) portion of my investments. I used to collect dividend paying stocks. I saw that as an alternative to collecting beer cans, corvettes, impressionist paintings, stamps, Matchbox cars or vacation homes. My preference was to buy stocks that I would see often in my daily life (such as Waste Management and Sysco trucks on the highway, or CSX trains) and to buy enough of each stock to pay me about $2,000 a year (roughly $5 a day) in dividends. It is fun to see a train go by and think that it is paying me $5 a day. For a while, I used the dividends to buy other dividend stocks, but now that I am retired, I just let the dividends stack up in my brokerage account, and then take a vacation with the money. I retired on January 1st of this year. Since then I have been to Mexico, Costa Rica, Nicaragua, Panama, Columbia, Aruba, Portugal, Sweden, Norway, Netherlands, Poland, Lithuania, Latvia, Estonia, Finland, and Iceland, with upcoming trips back to Portugal, Morocco, the Canary Islands and St. Marten. Most of the money I remove from my portfolio is interest and dividends. Part of my reason is that money is going to be taxed anyway, so I can spend it without creating another taxable event. I do some tax-loss harvesting as well to offset capital gains plus $3,000 each year. But I also monitor my portfolio to ensure that it continues to grow in retirement. If the market takes a turn for the worse, I will reinvest more of the dividends and interest. I live on pensions and social security. I play with dividends and interest. I think of only spending returns as a harmless game. But I also realize that I was very fortunate that I could work into my 70s and save most of my income until then. If I had retired at 62, I would be struggling to pay my bills. If I had retired at 66, I would be comfortable, but would be living on half my current income. Last edited by DonCamillo on Mon Jul 10, 2017 5:13 pm, edited 1 time in total. and the O’Shaughnessy study uses the 50 highest yield large cap stocks. with 55 years of analysis. is NOT the same screening or analysis as Professor Jeremy Siegal study. zuma wrote: I believed this common misunderstanding about dividends for most of my investing life. Thankfully, I found the Bogleheads forum a couple years ago and learned about total return. Like many people, I assumed that dividends were something like interest payments. The idea that taking dividends is fundamentally not different from selling shares feels deeply counterintuitive. It took quite a bit of reading to fully unlearn what I had previously believed was true. Until the internet came along, I assumed the majority of retail investors understood dividends were not the same as interest payments. Now, especially after hanging around this forum, I'd ***guess*** at least 50 percent of retail investors don't understand this. When I was in jr high or high school, I wondered why don't investors buy a stock the day before its dividend... easy money, right? (Granted, weird kid, now weird adult.) But looking at the stock tables (yep... dating myself), it was easy to see that the opening stock price was reduced by the dividend payment... alas no free lunch. So I simply assumed most investors knew this. It makes no sense to invest in a dividend focused fund just because of the dividends. Dividends are a proxy for value and there are better metrics to achieve this e.g. P/B. You see out-performance but you don't understand why. Avoiding dividends is a waste of time also. They are what they are. ThereAreNoGurus - it is probably more like 95%. I like WisdomTree's dividend weighting methodology. I hold three of their ETFs for global small cap value exposure. For domestic large cap value, VYM (Vanguard High Dividend Yield ETF) along with some SCHD (Schwab US Dividend Equity ETF) have me happy. Professor Jeremy Siegel. About 1 year old. "Were in the first inning of dividend stock investing". to the 1950's & 1960's where people bought stocks for income/dividends. edge wrote: It makes no sense to invest in a dividend focused fund just because of the dividends. Dividends are a proxy for value and there are better metrics to achieve this e.g. P/B. You see out-performance but you don't understand why. Avoiding dividends is a waste of time also. They are what they are. Haha... you could be right! I'm going to ask the few folks I know, who buy individual stocks, whether they realize a dividend does not result in an increase of principal. DonCamillo wrote: I like dividends on a (relatively small) portion of my investments. It's likely you bought those equities when they were considered small or midcaps, not the large caps they are now. Also likely you purchased them at much lower prices than today. Anyone purchasing individual equities has better be aware of all the risks, you can monitor all you like but you can not control the amount of dividends declared and paid nor where the equity closes today or tomorrow. I used to collect dividend paying stocks. They were already Megacaps, but most of them have more than doubled in price since I bought them. Most of my purchases were yielding about 4% when I was collecting dividend paying stocks, not the typical 2% today. I was concentrating mainly on dividend champions with a history of increasing dividends. While I agree that the market seems to have high valuations today, I also agree with the Bogleheads principle that "Time in the market is more important than timing the market." I used to work for AT&T. It was then known as a Widow's and Orphan's stock because it had been steadily paying dividends for over 100 years. During the time I worked for them, they got most of their income from long distance charges, and their revenue per minute from long distance went from about 25 cents per minute to zero. The stock collapsed, the company went from 1 million employees to 20,000, and the company was sold for a pittance to a former "Baby Bell" that had been spun off from AT&T in 1984. I took early retirement and watched stock options that were millions of dollars "in the money" go to nothing before I was qualified to execute them. The Fortune 500 is a very dynamic group. Most of the companies in that group when I started investing no longer exist. That may be disguised, as it is in the case of AT&T, but the company I used to work for is only a tiny portion of the company that bought it. I will admit that VHDYX is also dynamic, adding and losing companies all the time. But "Past performance is no guarantee of future returns." I hate the way it's called "Dividend INCOME". It's not called income if you take cash out of your bank account. Dividends should be called something else so people stop being confused about them. Dividend lovers seem to be completely obsessed with the word INCOME, almost like it is a drug to them. I have seen people say they don't care that the share value has plummeted by 50% as their dividend income has doubled (obviously just before it is about to be cut or taken away completely). That this meta thread started by probing potential reasons behind dividend misunderstandings and devolved into another debate over the merits of dividend investing shows just how deep these misunderstandings may run. There are a few close to 4%'ers out there that are dividend champions, but that requires one to have a contrarian view and be able to hold, those 4%'ers could easily be 5%'ers too, if conditions were right. Full disclosure - I hold a large cap value, dividend portfolio most of which have more than doubled, yes time in the market, but with individual equities as you alluded before, one must tend to them much like you tend to a garden to avoid it being overrun by weeds. The key is to understand which is the weed and which is the fruit bearing plant. Not all fruit bearing plants are like, some are more productive than others and some just wither away when they've reached the end of their productive lifespan. As an illustration, how much should I bid at auction for a box with a used iPhone in it? How much for the very same box with the very same used iPhone if everybody knows there's also a ten dollar bill in the box? This is not correct. The example would work like this: there is an iphone in the box plus a $10 component removed from that iphone in the box. You need the iphone plus the component to get a total iphone. In earlier days, before mutual funds and computers, investors would take a dividend from selected stocks for income of around 5%, and I suppose the idea was passed down through generations. In Benjamin Graham's day, yes, it was a good idea because it was easier and cheaper than selling stocks . But today, with mutual funds and the the ability to sell when necessary, taking divys doesn't make a lot of sense. For one thing, if you take divys you can't control when to make withdrawals. You would not want to take divys when the market is down. Far better to let the divys buy more shares and then make a withdrawal at an optimal time. As a thought experiment, I wonder how much investor behavior would be affected if tax laws were changed so that stock dividends collected by funds did not have to be distributed to shareholders, and could remain baked into share price as unrealized capital gains. Of course it has no chance of happening as it would result in an immediate short term decrease in tax revenue. But it would be a huge advantage for investors and make stocks-in-taxable vastly more tax-efficient. It would also end the kvetching about buying a dividend or whether to auto-reinvest. But I suspect the most notable effect would be a huge flow out of funds and into individual dividend-paying stocks. House Blend wrote: As a thought experiment, I wonder how much investor behavior would be affected if tax laws were changed so that stock dividends collected by funds did not have to be distributed to shareholders, and could remain baked into share price as unrealized capital gains. Such funds exist in some countries, I think notably the UK, at least as I understand it. minimalistmarc wrote: Dividend lovers seem to be completely obsessed with the word INCOME, almost like it is a drug to them. Yes, dividend enthusiasts are more concerned with the number of shares than the value of those shares. During accumulation, they love to reinvest their dividends and see the number of shares climb. Then during distribution, they love to cash their dividend checks and see the number of shares remain the same. The dividend pitch can be pretty compelling, it goes something like: "Those total return guys with their backtests and monte carlo sims keep telling me if I do everything right, there's a 90% chance I won't run out of money. That's not good enough for me! Wouldn't you rather have a stable and reliable income stream built from dividends? If your dividends cover your expenses, there's a 100% chance it will last forever and you'll never have to draw down your investments." This is of course the premise referenced in the OP. Another core belief among dividend lovers seems to be that the dividend itself is an indicator of a company that's safe, stable, and healthy. Circular arguments are always going to be compelling. Yep. "Accumulation" and "Distribution", often even ETF's come in the two flavours in Europe. minimalistmarc wrote: I hate the way it's called "Dividend INCOME". Setting aside US income tax law, I agree with you. If I take assets out of my left front pocket and put them into my right, even if it was a taxable event, was it legitimately income? Maybe yes. I bought the assets with what then was income, and they fluctuated in value as financial assets do. Apart from income tax it was income, but is it now income? I concede in this instance I'm doing what I have often cautioned against, that is to say applying colloquial meanings of words to terms of art. Should we think of it as if it's income? Lest the FBI, or for that matter the FSB, get all angry, I am entirely in favor of every individual and every business paying their income taxes in full, and I personally always do. goingup wrote: Our retirement income streams will include rents, royalties and dividends. We like income streams and there is no misunderstanding. Sure, we can and will sell shares to fund retirement as well. I see no problem with appreciating dividends as part of a total return strategy. I think the misunderstanding comes from people here who think anyone who doesn't hold their nose when cashing a dividend check is either misguided or daft. Really?...Does snarlyjack just a few posts below has it right? Just curious what your thoughts are?